I've had the Biolage Hydratherapie Conditioning Balm for about 8 months now. I bought it earlier on in my hair journey because I wanted a protein-free moisturizing deep conditioner and this conditioner received rave reviews. 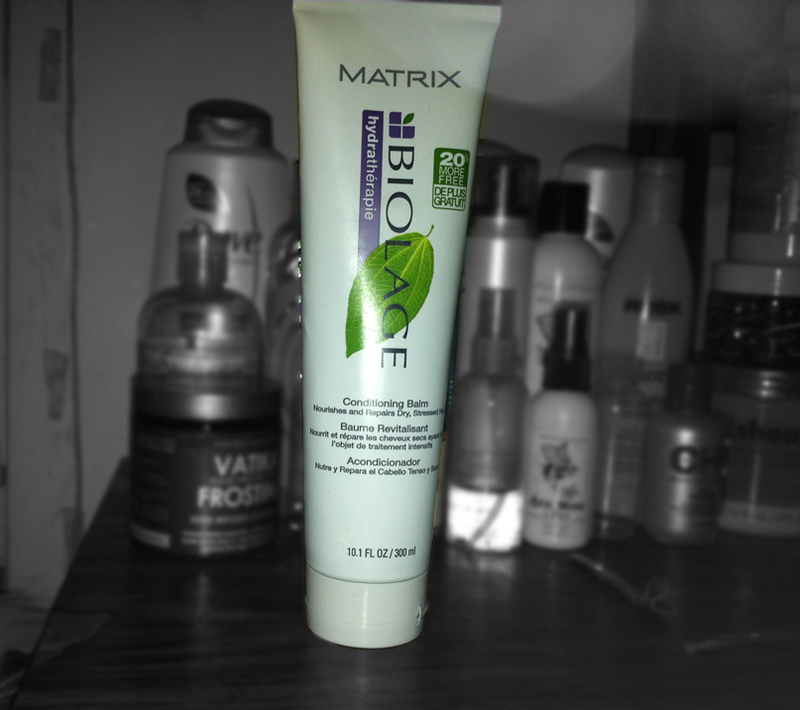 I desperately wanted to like this conditioner, it has great, simple ingredients and it even has a lovely clean scent. I have used most of the tube, so I've used it at least 5 times. I have tried using this in a variety of different ways: by following the instructions, leaving it in for 15 minutes with heat, adding Roux Porosity Control and using it in my new detangling method. While this conditioner didn't damage my hair, or increase breakage, it simply didn't do much for my hair. It didn't provide any slip and it didn't leave my feeling particularly moisturized. The best results I received from this product were using it prior to shampooing and after I had already applied oil to damp hair and left it in when using the detangling method I mentioned earlier. I typically don't like to "doctor" up my conditioners, so I don't usually keep ones that require me to mix them with other stuff, especially considering this conditioner's rather high price (in NYC, its typically between $25-$32/10.1 ounce tube). I most likely will not repurchase this conditioner, I just don't think it was moisturizing enough for the texture and density of my hair. Perhaps this conditioner would be better for someone with finer hair. Having said that, although it didn't work out for me, you may love it, so give it a try. It certainly didn't hinder my hair journey or cause me any negative reactions. This conditioner gets its points for being a moisturizing conditioner that lacks silicone, mineral oil, petroleum and protein. It also smells nice and has a thick, slightly sticky consistency. I'm not ready to give up on Biolage just yet though, lol. I checked their site today and noticed their Ultra-Hydrating Balm that is specifically geared to people with thick, coarse dry hair, so maybe that one will be better for me. I'll keep you posted! Claims: Biolage Conditioning Calm infused with a blend of rosemary and golden seal helps provide dry hair with the care and moisture replenishment it needs to be healthy, vibrant and beautiful. Perhaps the ultra version would have been a better fit for you? Yeah, I considered trying it, but i found a much better DC so I left Biolage alone lol.